Introducing the Stricklin reclining loveseat. A first-class offering in recliner design. 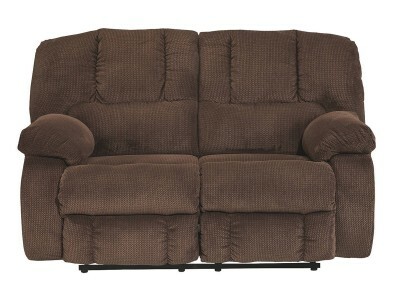 It’s tailor..
A classic split personality, the Chocolate overstuffed reclining loveseat is a real softie on the in.. The Clearmont reclining loveseat with console lives up to its name—if we’re talking sparing that "pu.. Ample seating room makes the comfort possibilities endless. Sit back and relax. You won’t go w..
Motion Type RecliningMaterial FabricStyle Modern-ContemporaryFinish Cocoa..
Defend against discomfort with a perfect addition to your seating lineup. The Lewes DuraBlend® .. Looking to raise the comfort level of two? Lunar reclining loveseat sweeps both of you off your feet..
Center console has handy cup holders as well as an ingenious storage compartment. Ultra-soft c..
Pharrel is the sophisticated reclining loveseat you’ll love. Not only is it stylish, it’s also extre.. 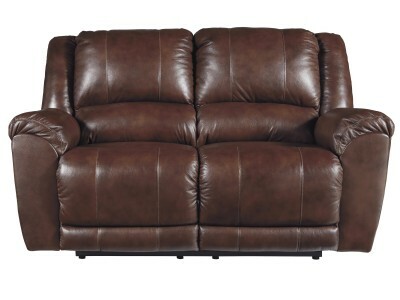 Enjoy every inch of comfort in the Quin reclining loveseat. Simply pull the tab to recline. As soft ..
No need to sacrifice looks for comfort. The Roberta reclining loveseat serves up both with a richly ..